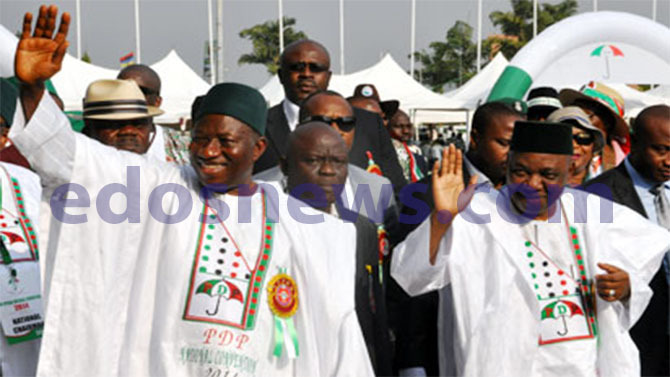 Director General of the Presidential Campaign Organisation of the Goodluck/Sambo, Kaduna state chapter, Alhaji Husaini Jallo yesterday said over two million people would be mobilised for Goodluck Jonathan presidential rally in Kaduna. Jallo stated this during the inauguration ceremony of the 35-Woman Campaign Committee, where he charged party women to mobilise at least 2000 women from the 255 wards in the state to turnout enmasse as President Goodluck Jonathan campaign visits Kaduna on Saturday 31st January 2015. “I expect atleat 2000 women from each ward to come out as President Jonathan campaign team visit us, we must show that Kaduna is for the PDP, because here is the home state of the Vice President of the Federal Republic of Nigerian Arch. Mohammed Namadi Sambo. Stressing further he urged the Committee members not to limit their campaign to that of the Presidential alone, but to campaign for all the PDP candidates vying for various elective posts. Responding, the leader of the Committee, Madam Nah Gambo promised to work hard for the success of President Goodluck Jonathan in the general election as well as all the candidates of the ruling party vying for various positions. On her part, Mrs. Laitu Danladi former Peoples Democratic Party Woman Leader North-west and a member of the 35-woman Committee branded the All Progressives Congress as an empty barrel, which she said make the laudest noise.